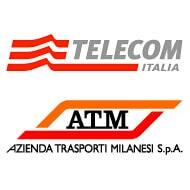 Telecom Italia and ATM, operator of Milan’s public transport network, have announced plans to run a six month NFC ticketing trial from 11 April with a view to introducing a commercial service by the end of 2011. The new Mobile Pass service will allow users of Milan’s buses, trams and underground network to both purchase transport passes with an NFC phone and validate them for travel. Participants in the trial will be issued free of charge with a Samsung S5230 NFC phone running a transport ticketing software application developed by Telecom Italia.